Preheat oven to 350º and line two cookie sheets with parchment. Cream butter and sugar together until light and fluffy, 3 to 4 minutes. Mix in egg and vanilla and almond extracts. In a separate bowl, whisk together dry ingredients. Add dry ingredients to wet ingredients and mix until smooth. Dough will be thick. Make three sizes of cookie dough balls: 1 teaspoon, 2 teaspoons, and 3 teaspoons. (You should have an even number of each.) Place medium and large cookies on a cookie sheet and press down slightly on each. Bake until center looks mostly cooked, 7 to 8 minutes. Place smallest balls of dough on another cookie sheet and press down slightly. Bake until center looks mostly cooked, 5 to 6 minutes. When cookies are done, remove from oven and let cool 2 to 3 minutes, then transfer to a cookie rack to finish cooling. Make frosting: Beat butter until smooth. Add half the powdered sugar and mix until smooth. Add vanilla and 2 tablespoons water and mix until smooth. Add remaining powdered sugar and mix until smooth. Add green gel icing color to frosting and mix until your desired shade of green. Assemble cookies: Get one size of each cookie. Fit a piping bag with a medium sized star piping tip (I used Wilton 32) and fill bag with green frosting. Pipe a swirl of frosting onto the largest cookie, then add the second medium sized cookie on top. Pipe a swirl of frosting onto the second cookie, then top with the smallest cookie. Pipe a swirl on top of the final cookie and decorate with a star and round ornament sprinkles. 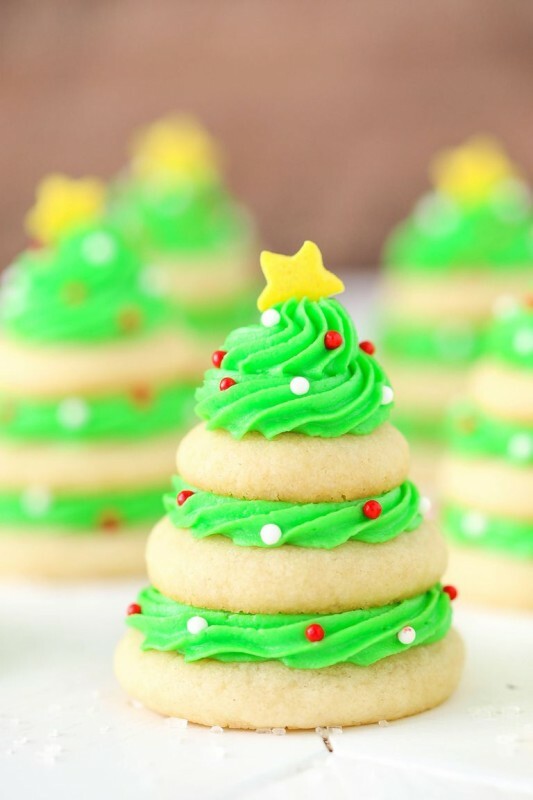 Continue building cookie trees, then refrigerate until ready to serve.